Background: Hypertension is the most common cardiovascular disorder posing a major public health challenge to the population. Homoeopathy, although widely used in hypertension, is assumed to have nothing but placebo effects and its specific clinical effects are frequently ascribed as implausible. Aims: To evaluate whether individualized homoeopathy can produce any significant effect different from placebo in essential hypertension by comparing the lowering of blood pressure between groups. Settings and Design: A prospective, double-blind, randomized, placebo-controlled, parallel-arm clinical trial was conducted at the Outpatient Clinic of the Mahesh Bhattacharyya Homoeopathy Medical College and Hospital, West Bengal. Material and Methods: Out of 233 hypertensives assessed for eligibility, 150 were enrolled and randomized (verum/homoeopathy 70, control/placebo 80). A total of 18 dropped out and 132 were regular (verum 64, control 68). The outcome measures were assessed after three months and six months. Statistical Analysis: The intention-to-treat population was subjected to statistical analysis. Group differences were tested using the χ2 test and independent t test. Repeated measure (ANOVA) was performed to compare the data of two groups obtained longitudinally at baseline, three months and six months. Results: The baseline data were not significantly different between the groups. After six months, mean Systolic Blood Pressure (SBP) reduction was 26.6 mm Hg (95% CI 21.5, 31.7) in the homoeopathy group and SBP increased by 3.6 mm Hg (95% CI -8.7, 1.5) in the placebo group. Similarly, the mean Diastolic Blood Pressure (SBP) in the homoeopathy group reduced by 11.8 mm Hg (95% CI 9.2, 14.4) and increased by 1.6 mm Hg (95% CI -3.6, 0.4) in the placebo group. Repeated measures ANOVA also showed significant difference (P=0.0001) between the groups. Natrum muriaticum, Calcarea carbonica, Sulphur, Thuja occidentalis, Nitric acid and Medorrhinum were frequently prescribed. Conclusion: Individualized homoeopathy produced a significantly different hypotensive effect than placebo. The aim of this trial was to evaluate whether individualized homoeopathy could produce any significant hypotensive effect different from placebo in patients with essential hypertension by comparing the lowering of blood pressure between groups. To the best of the authors' knowledge, this was the first randomized controlled trial conducted to compare individualized homoeopathy with placebo in essential hypertension. The study was a randomized, placebo-controlled, parallel-arm trial, conducted at the Outpatient Clinic for hypertensive patients at the Mahesh Bhattacharya Homoeopathy Medical College and Hospital, Howrah, West Bengal, India, between April 2011 and February 2012, as per the Reporting Data on Homoeopathy Treatments (ReDHoT) guidelines. Screening and enrollment was continued for the first six months followed by intervention and follow-up for the next six months [Figure 1]. The study protocol was completely in accordance with the Helsinki declaration on human experimentation  and Good Clinical Practice,  in India. Clearance was obtained from the Ethics Committee of the institution. Consequently, each participant was verbally explained about the study, with the help of the Patient Information Sheet, and thereafter, a written consent was obtained from them. However, they were free to withdraw from the study at any point in time. Trial Number (UTN) 'U1111-1128-2447' and Protocol Identification No. '1343/MBHMCH/CH/H/01/11'. The study inclusion criteria consisted of patients (1) suffering from essential hypertension (pre-hypertensives: SBP 120-139 mm Hg, DBP 80-89 mm Hg, stage I hypertensives: SBP 140-159 mm Hg, DBP 90-99 mm Hg; and stage II hypertensives: SBP ≥60 mm Hg, DBP ≥100 mm Hg);  (2) aged 18-65 years; (3) of both sexes; (4) with at least a six-month history of suffering; (5) whose history, examination, and routine investigations revealed no evidence of obvious secondary causes; and (6) giving written informed consent. Cases were considered excluded where (1) diagnosis or findings from the history were uncertain; (2) physical examination or routine investigations produced suspicion of a secondary cause for hypertension; (3) the cases were diagnosed (provisional/confirmatory) cases of secondary hypertension; (4) there was any kind of continued anti-hypertensive therapy for at least six months; (5) the cases were of malignant hypertension (SBP >200 mm Hg and DBP >140 mm Hg) with clinical features of hypertensive encephalopathy (severe headache, vomiting, visual disturbances, transient paralysis, convulsion, stupor and coma), cardiac decompensation (heart failure), and rapidly declining renal function (oliguria); (6) patients were suffering from isolated systolic hypertension (SBP ≥140 mm Hg and/or DBP < 90 mm Hg), as was mostly found in elderly patients;  (7) patients were with labile (sometimes, but not always, arterial pressure in the hypertensive range, i.e. not sustained) hypertension;  (8) patients were not strictly conforming to the criteria given by the Joint National Committee - 7 (although variation of ± 10 mm Hg in SBP and/or DBP was considered);  (9) there was a presence of severe concomitant disease (s); (10) there was a failure of vital organs/systems, for example, heart, lungs, liver, kidney, and the like, as detected clinically; (11) there was a presence of any systemic (endocrinal/cardiovascular/locomotor/neurological/hematological/psychiatric, etc.) or infectious disease(s) the patients were already diagnosed or detected clinically or by routine laboratory investigations; (12) there were immunocompromised patients; (13) diagnosed cases of developmental defects or congenital abnormalities; (14) pregnant patients, patients who were breast feeding and/or with likelihood of pregnancy; and (15) patients with a history of drug and/or alcohol abuse. A range of homoeopathic potencies were used as per the requirement, decided by the treating physicians. All the medicines used were manufactured by a Good Manufacturing Practice certified homoeopathy pharmaceutical company and were prepared strictly in adherence with the regulations/instructions of the Homoeopathic Pharmacopoeia of India. Medicines in all forms and placebo were dispensed in Good Clinical Practice environment. Each dose, administered orally, either medicine (in centesimal potencies) or placebo, identical in appearance, consisted of a single drop of medicine or comparator placebo in 83.1% ethanol in 10 ml distilled water and was served in identical amber-coloured glass vials. These were directed to be taken once daily, that is, every 24 hours. For 50 millesimal potencies, a single medicated/non-medicated globule No. 10 was dissolved in 60 ml of distilled water, with addition of two drops of 83.1% ethanol, divided into 10 equal doses. Each dose was directed to be taken after 10 equal downward strokes into half a cup (45 ml) of normal water, from which a single teaspoon (5 ml) was to be taken and the rest discarded. Successive doses were continued in a similar fashion until a mild homoeopathic aggravation, as per homoeopathic principles, took place. During intercurrent acute illness, the medicines were prescribed in either centesimal or 50 millesimal potencies, as appropriate for the case. The outcome measures were changes in the systolic and/or diastolic blood pressure at a timeline of three months and six months. The effect size was considered as the lowering of systolic and diastolic BP by a minimum of 15 mm and 6 mm Hg, respectively. Thus, cases where this lowering in systolic and diastolic BP was observed were ascribed as 'improved' and the rest as 'not improved'. The study end-point was lowering of BP following intervention. The primary safety end-point was any adverse event during the study in any of the groups. The stopping guidelines were, a marked deterioration of health condition and/or constant increase in BP among subjects in either group, constant progress of disease with appearance of complications, and adverse events (if any). The effect size calculated from the study on hypertension conducted by CCRH  was 0.6 [SBP: 157.65 ± 13.05 versus 143.41 ± 12.41, Cohen's d = 1.13, effect size = 0.5; DBP: 100.77 ± 4.04 versus 89.13 ± 7.75, Cohen's d = 1.88, effect size = 0.7; overall effect size = 0.6; calculated at UCCS Effect Size Calculators; http://www.uccs.edu/~lbecker/; © 1998, 1999 Dr. Lee A Becker, University of Colorado, Colorado Springs]. Taking into account the effect size (Standardized difference) of 0.6, power 90%, and significance level (α) of 5%, the required sample size determined was 118 by the Altman's nomogram. Keeping a provision for dropouts of about 27%, the targeted sample size became 150. The hypertensive status of the study population was initially confirmed by taking the average of the measured blood pressure twice on two separate occasions in two contralateral arms in a supine position during rest, using a mercury sphygmomanometer of standard cuff size, throughout the study. Every case was subjected to detailed screening by a specified eligibility criteria followed by recruitment in the trial. After recruitment, all were subjected to baseline assessments. The pre-entry and post-intervention laboratory investigations performed were as follows: Blood for routine investigation (haemoglobin%, White Blood Cells (WBC)/WBC total count (TC) and differential count (DC), Erythrocyte Sedimentation Rate (ESR) first hour, fasting and postprandial sugar, urea, creatinine, total cholesterol, High Density Lipoprotein cholesterol/HDLc, Low Density Lipoprotein cholesterol/LDLc, Very Low Density Lipoprotein cholesterol/VLDLc and triglyceride), urine analysis (albumin, blood, WBC or pus cells), chest x-ray PA (posteroanterior) view, and electrocardiogram (ECG) were performed before and after an intervention of six months. Data were extracted from the reports directly and independently. Pre-designed proforma were used by the investigators. All these were compiled at the end; data were extracted and analyzed. Out of 233 hypertensive patients assessed for the eligibility criteria, 150 were enrolled. Then individual treatment was prescribed to all the enrolled participants by the treating physicians. The treating physicians were free to decide the homoeopathy medicines, dosage, and repetitions to be applied. Following prescription, a random allocation sequence was generated by a coin-toss method and dividing the sample into two groups. Randomization codes ('h' = heads, 't' = tail) were mentioned on the prescription of each participant by the treating physicians and were sent to the pharmacist. The pharmacist was instructed to serve either medicine or placebo to the groups as per the mentioned codes on the prescription. The treating physicians were kept blinded from the code of allocation, in strict confidentiality, throughout the study. The codes were broken after the end of the trial when the dataset was frozen. Thus, 70 participants were found to be randomized to verum (homoeopathy) and 80 to control (placebo). A total of 18 were dropouts and 132 were regular (subjects 64, control 68). Double blinding was checked early and also during the trial (by MM) by asking the patients in which group they believed they were during the trial. If necessary, the prescription was changed in the course of time, and of course, the patients who started on placebo stayed on placebo, except during intercurrent acute illness. Treating physicians were house-staffs in the Department of Medicine of the hospital. Of them, two had masters in dietetics and all of them had a practicing experience of one year in the hospital. Necessary inputs regarding the selection of medicine were taken from experts, who had enough expertise and 10 years of experience in hospital practice. All the participants were given additional instructions regarding the diet (DASH diet; i.e., Dietary Approach to Stop Hypertension) and regimen, keeping in mind their socioeconomic status and level of education. The usual measures included avoiding tobacco and alcohol, restricting salt and saturated fat in the daily diet, increasing fruit and fibre content in the diet, and encouragement to undertake more physical activity. These additional measures were advised to all the participants to minimize bias. A detailed case recording of each patient was done by the investigators as per the guidelines laid down by Hahnemann in Organon of Medicine  and Kent's philosophy. Repertorization was done on the basis of the totality of symptoms by Kent, Boenninghausen, and Synthesis repertories using the RADARÓ software. After repertorization, the medicine was selected on the basis of the Homoeopathy Materia Medica. , In either group, patients were followed up in person on every fourteenth day and finally after six months, by measurement of blood pressure. In either group, all follow-ups were done as per the guidelines laid down for the second prescription in the protocol, that is, increasing the potency and change of medicine depending on the outcome of the first prescription. A maximum of two changes in the prescription were permitted. Any acute complaint arising during the follow-up was prescribed the indicated remedy as the prevailing symptomatology suggested. During the six-month trial, all data were measured and analyzed at entry, after three months, and after six months of the study by the outcome assessor (blinded, AD). Intention to treat (ITT) population was subjected to statistical analysis. Comparable baseline characteristics and potential variables were matched to evaluate whether the samples originated from the same distribution and whether they differed statistically significantly or not. Missing values were calculated by the maximum likelihood method of estimation of the lambda parameter of normal distribution. Various statistics computational websites, for example, Vassar University statistical software ( http://vasarstats.net ), GraphPad software ( http://www.graphpad.com/quickcalcs/ ), Jumk.de statistics calculator ( http://jumk.de/statistic-calculator ), WessaNet statistics software ( http://www.wessa.net/rwasp_ ), and Jeromy Stangroom's social science statistics ( http://www.socsscistatistics.com/tests ) were used for statistical calculations. Repeated measures ANOVA was done using SPSS version 20. The data were checked for normal/non-normal distribution using descriptive statistics of skewness and kurtosis and appropriate tests (parametric/non-parametric) were performed accordingly. The analysis was planned to be performed on demographic data and treatment outcomes, to test the group differences, using the Chi-square (χ2 ) test and independent t test. If significant difference was obtained, repeated measure (ANOVA) was planned to perform to compare the data of two groups obtained at different points of time, that is, at baseline, after three months, and after six months. Out of 233 hypertensive subjects assessed for the eligibility criteria, 83 were excluded and 150 were randomized into two groups - verum (homoeopathy) and placebo. 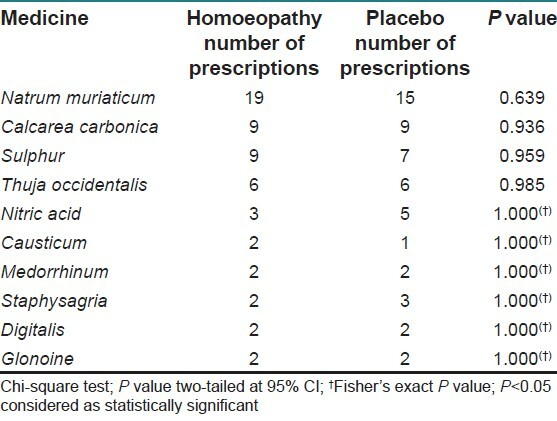 Sixty-four participants in the homoeopathy group out of 70 were allocated, and 68 out of 80 participants in the placebo group were included in the final analysis. There was a total dropout of 18 cases in the trial (verum 6, placebo 12). In the verum group, two subjects withdrew themselves from the study, three failed to continue regular follow-up for the minimum required duration/investigations for the conduct of analysis, and one developed hepatitis during the course of study and attended other treatment. 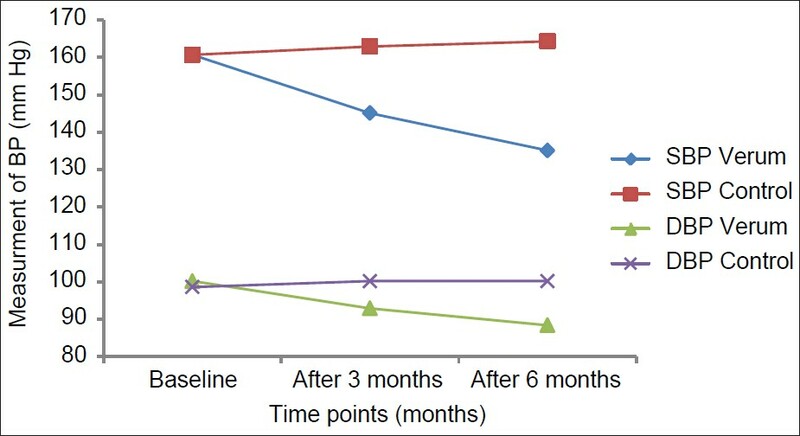 In the placebo group, eight subjects withdrew themselves from the study; three were irregular, and one needed active therapeutic intervention for sudden deterioration of condition [Figure 1]. The available data was subjected to assessment of skewness and kurtosis as descriptive analysis to determine normal/non-normal distribution. Skewness ranged from −0.27 to −0.47 and kurtosis around three in both verum and control indicating an approximate normal distribution. Baseline demographic characteristics, clinical indices, and pathological-biochemical parameters were tested using the independent t-test and Chi-square test. They were found to be similar and no statistically significant difference existed between the groups [Table 1]. After six months of intervention, change in blood pressure showed a statistically significant trend in favour of homoeopathy. Blood pressure was lowered significantly in fifty-four (84.4%) and nine patients (13.2%) in the verum and control groups, respectively, (χ1 2 = 64.06; P = 0.000, two-tailed). BP remained unimproved (static or deteriorated) in 10 (15.63%) patients in the verum group and 59 (86.76%) patients in the control group. After three months, mean SBP and DBP reduction was 16.6 (95% CI 9.9, 23.3) and 7.3 (95% CI 4.1, 10.5) mm Hg respectively in the homoeopathy group. Contrarily, mean SBP and DBP raised by 2.2 (95% CI -7.2, 2.8) and 1.6 (-3.6, 0.4) mm Hg respectively in the placebo group. Again after six months, mean SBP and DBP reduction was 26.6 (95% CI 21.5, 31.7) and 11.8 (95% CI 9.2, 14.4) mm Hg respectively in the homoeopathy therapy group. The mean SBP and DBP increased by 3.6 (95% CI -8.7, 1.5) and 1.6 (-3.6, 0.4) mm Hg respectively in the placebo group. Repeated measures ANOVA was performed comparing data obtained at baseline, at 3 months and 6 months, which also revealed significant difference between the two groups, both in SBP[F=77.2]; P=0.0001 and DBP[F=63.2]; P=0.0001. The most frequently prescribed homoeopathic medicines in both groups were Natrum muriaticum (n = 19, 15), Calcarea carbonica (n = 9, 9), Sulphur (n = 9, 7), Thuja occidentalis (n = 6, 6), and Nitric acid (n = 3, 5) in varied potencies [Table 3]. Among incurrent antimiasmatics, Medorrhinum, Nitric acid and Thuja occidentalis were frequently used; Bacillinum, Sulphur, and Syphilinum each were used in single cases. No serious adverse events were reported during the study period, except a single case of hepatitis in the verum group and one case of deterioration of condition in control group; however, those cannot be attributed to causality. Mild-to-moderate homoeopathic aggravation, as per homoeopathic principles, was observed. Individualized homoeopathy definitely produced some hypotensive effects different from placebo. Homoeopathic prescriptions in our study were based on homoeopathic principles. Mild-to-moderate hypertension in many cases is asymptomatic, emphasizing the need for a holistic approach. The trial was made double-blind by the blinding participants, the outcome assessor, and treating physicians. Double-blind studies on individualized homoeopathy where physicians are given a free hand for prescriptions are rare, probably due to the inherent problems in the methodology of treatment, that is, the individualization procedure, treatment by multiple remedial agents in various potencies prepared under various scales for a single clinical diagnosis, and so on. We followed the instructions of Kleijnen et al.,  for making the study double blind, that is, an 'individual treatment is prescribed, and then the patients are randomly allocated to homoeopathy or placebo treatment'. Double blinding was checked early in the trial, before the treatment was expected to take effect by asking the patients in which group they believed they were in during the trial. Otherwise, any positive effect would break the code, especially when chances of diffusion of treatment (contact between verum and control subjects) could not be removed completely. However, the 'quasi-randomization' by the coin-toss method may be improved by adopting computer-generated random number lists, in future researches. As the randomization was a bit different from the usual procedures, traditional allocation concealment mechanisms (e.g., consecutively numbered drug containers, sequentially numbered, opaque, sealed envelopes etc.) were not followed. Bias was tried to be minimized by blinding of participants, treating physicians, and the outcome assessor (AD, expert of conventional system of medicine, who was neutral about homoeopathy and did not participate in the treatment); randomization of participants into subject and control groups; and matching for comparable baseline characteristics and potential variables. Besides, due to limited infrastructure and absence of an Intensive Care Unit, malignant hypertension cases were excluded from this study. Also, retinoscopic examination was not possible on account of want of faculty. A larger sample size was considered in this trial in comparison to two other published randomized trials. , Also, individualized homoeopathy was tested in this study revealing a positive outcome and a significantly different effect from the placebo. Furthermore, the objective of this study was not to suggest any single homoeopathy remedy for essential hypertension. Larger trials in future, in multicentric design, may suggest a subgroup of remedies that are more frequently indicated in this clinical condition. The final differentiation of the remedies was made after referencing drug pictures of different Materia Medica, and a remedy matching the totality was chosen, taking care that it also corresponded to the predominant miasmatic influence in the case. Natrum muriaticum, Calcarea carbonica, and Sulphur were indicated in most of the cases; however, these remedies were chosen strictly on the principles of homoeopathy and should never be used specifically or blindly to control hypertension. In some cases, especially where characteristic symptomatology and precise prescribing totality were lacking, remedy selection was influenced by constitutional attributes, generalities, and the fundamental cause, that is, the chronic miasm in the background. Treatment was often difficult due to this fundamental miasm; sometimes improvement ceased even after administration of a well-selected remedy; sometimes, remedies failed to make any impression in spite of certain indications; occasionally they completely obscured the symptomatology. These cases required intercurrent anti-miasmatic remedies to remove the block. Prescription in such instances became presumptive rather than a certainty, and success or failure of the selected remedy was indicated only on a serial repetition of BP measurement, in the absence of a demonstrable aberration in health. During the follow-up visits, the remedy was repeated only when necessary, in the same potency or with a change in potency, as indicated. Likewise, a change in remedy also was considered only when essential, after careful evaluation of the follow up. In cases where both were not necessary, only placebo was prescribed. Some individuals in the placebo group experienced improvement, probably due to individual variation by adaptation of and meticulous adherence to the additional lifestyle modification measures concerning diet and regimen that were advised to all, to eliminate the bias. Homoeopathic principles were not followed in the two randomized controlled trials on hypertension performed to date; and quite obviously, the findings were negative. No statistically significant differences were found between the effects of placebo and active drug (Baryta carbonica 15cH) on the blood pressure. The earlier study concluded that a blood pressure lowering effect under pharmacotherapy was clearly superior to that under homoeopathy, where it was negligible and statistically not significant. However, the observational studies, although methodologically inadequate, yielded positive outcomes favouring homoeopathy. ,, Our study findings generated conflicting evidence in the outcomes of the previous two RCTs and confirmed that homoeopathic medicines, when applied as per principle, can definitely produce significant effects different from placebo. Finally, in order to build credibility within the medical research field, multiple replications and/or extensions using the same or similar approaches to treat the different diseases are necessary. Multi-site research with larger sample sizes is essential to improve the confidence level and generalizability of the study findings. Finally our data suggest that individualized homoeopathy treatment may have significantly beneficial effects different from placebo in patients suffering from essential hypertension. It may be adopted as an alternative public health approach in curbing the increasing prevalence of hypertension throughout the globe. However, further research in multicentric design is required on larger sample size before making firm recommendations. The authors would like to thank Prof. Amitava Biswas, Principal, Mahesh Bhattacharyya Homoeopathy Medical College and Hospital, Government of West Bengal, for giving permission to conduct the trial in his institution; and also Mr. Suman Khatua for his outstanding technical support and assistance. 1. Gaziano T, Reddy KS, Paccaud F, Horton S, Chaturvedi V.Cardiovascular disease. In: Jamison DT, Mosley WH, editors. Disease Control Priorities in the Developing World. Oxford: Oxford University Press; 2006. 2. Reddy KS, Shah B, Varghese C, Ramadoss A. Responding to the threat of chronic diseases in India. Lancet 2005;366:1746-51. 3. World Health Organization.The World Health Report 2002: Reducing Risk, Promoting Healthy Life. Geneva, Switzerland: World Health Organization; 2002. 4. World Health Organization. Global Status Report of NCD 2010. Geneva: World Health Organization; 2011. 5. O′Donnell MJ, Xavier D, Liu L, Zhang H, Chin SL, Rao-Melacini P, et al. Risk factors for ischaemic and intracerebral haemorrhagic stroke in 22 countries (the INTERSTROKE study): A case-control study. Lancet 2010;376:112-23. 6. Yusuf S, Hawken S, Ounpuu S, Dans T, Avezum A, Lanas F, et al. Effect of potentially modifiable risk factors associated with myocardial infarction in 52 countries (the INTERHEART study): Case-control study. Lancet 2004;364:937-52. 7. Kearney PM, Whelton M, Reynolds K, Muntner P, Whelton PK, He J. Global burden of hypertension: Analysis of worldwide data. Lancet 2005;365:217-23. 8. Mackay J, Mensah G. Atlas of Heart Disease and Stroke. Geneva: World Health Organization; 2004. 9. Gupta R. Trends in hypertension epidemiology in India. J Hum Hypertens 2004;18:73-8. 10. Thankappan KR, Sivasankaran S, Khader SA, Sarma PS, Mini GK, Vasan RS. 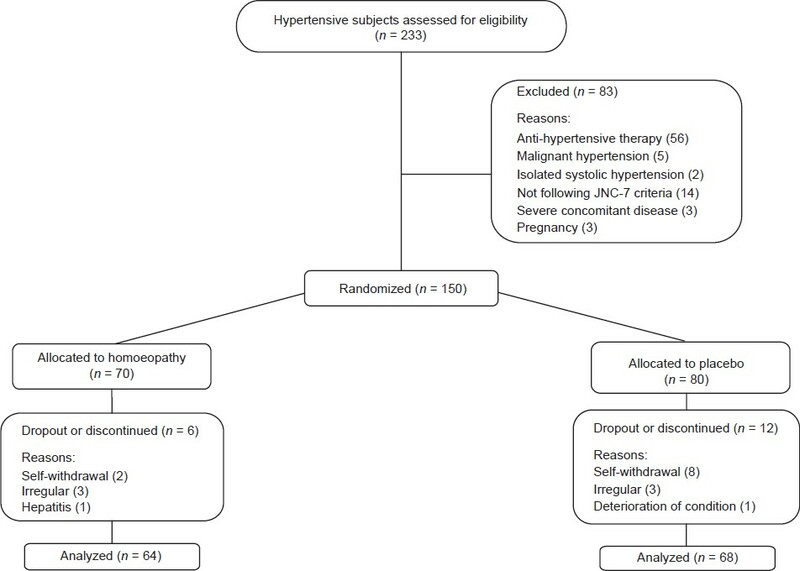 Prevalence, correlates, awareness, treatment and control of hypertension in Kumarakom, Kerala: Baseline results of a community-based intervention program. Indian Heart J 2006;58:28-33. 11. 11 Das SK, Sanyal K, Basu A. Study of urban community survey in India: Growing trend of high prevalence of hypertension in a developing country. Int J Med Sci 2005;2:70-8. 12. Gupta R, Gupta VP. Hypertension epidemiology in India: Lessons from Jaipur Heart Watch. Curr Sci 2009;97:349-55. 13. Gupta R, Sharma AK, Gupta VP, Bhatnagar S, Rastogi S, Deedwania PC. Increased variance in blood pressure distribution and changing hypertension prevalence in an urban Indian population. J Hum Hypertens 2003;17:535-40. 14. Reddy KS, Prabhakaran D, Chaturvedi V, Jeemon P, Thankappan KR, Ramakrishnan L, et al. Methods for establishing a surveillance system for cardiovascular diseases in Indian industrial populations. Bull World Health Organ 2006;84:461-9. 15. Anchala R, Pant H, Prabhakaran D, Franco OH. Decision support system (DSS) for prevention of cardiovascular disease (CVD) among hypertensive (HTN) patients in Andhra Pradesh, India: A cluster randomized community intervention trial. BMC Public Health 2012;12:393. 16. Hypertension Study Group. Prevalence, awareness, treatment and control of hypertension among the elderly in Bangladesh and India: A multicentre study. Bull World Health Organ 2001;79:490-500. 17. Conen D, Ridker PM, Buring JE, Glynn RJ. Risk of cardiovascular events among women with high normal blood pressure or blood pressure progression: Prospective cohort study. BMJ 2007;335:432. 18. Chapman E, Jonas WB, Levin JS. Homoeopathy : Essentials of Complimentary Medicine. Philadelphia: Lipincott Williams Wilkins; 1999. 19. Shang A, Huwiler-Muntener K, Nartey L, Jüni P, Dörig S, Sterne JA, et al. Are the clinical effects of homoeopathy placebo effects? Comparative study of placebo-controlled trials of homoeopathy and allopathy. Lancet 2005;366:726-32. 20. Linde K, Clausius N, Ramirez G, Melchart D, Eitel F, Hedges LV, et al. Are the clinical effects of homoeopathy placebo effects? A meta-analysis of placebo-controlled trials. Lancet 1997;350:834-43. 21. Bignamini M, Bertoli A, Consolandi AM, Dovera N, Saruqqia M, Taino S, et al. Controlled double-blind trial with Baryta carbonica CH versus placebo in a group of hypertensive subjects confined to bed in two old people′s homes. Br Hom J 1987;76:114-9. 22. Hitzenberger G, Korn A, Dorcsi M, Bauer P, Wohlzogen Fx. Controlled randomized double-blind study for the comparison of the treatment of patients with essential hypertension with homoeopathy and with pharmacologically effective drugs. Wien Klin Wochenschr 1982;94:665-70. 24. Homeocare International Pvt. Ltd. (HCI), India; c homeocare.in. [Cited 2011 Mar 25]. Available from: http://www.homeocare.in. 25. Similima.com; 2011. [Cited on 2011 Mar 25]. Available from: http://www.similima.com. 26. Dean ME, Coulter MK, Fisher P, Jobst KA, Walach H. Reporting data on homoeopathy treatments (ReDHoT): A supplement to CONSORT. J Alt Complement Med 2007;13:19-23. 27. World Medical Association Declaration of Helsinki′s Ethical Principles for Medical Research involving Human Subjects. Bulletin of the World Health Organization, 2001. [Cited 2011 Mar 25]. Available from: http://www.who.int/bulletin/archives/79 (4) 373.pdf. 28. Guidelines for Good Clinical Practice. ICH topic E6 (R1); EMEA - European Medicines Agency; July 2002; CPMP/ICH/135/95. 29. Chobanian AV, Bakris GL, Black HR, Cushman WC, Green LA, Izzo JL Jr, et al. The Seventh Report of the Joint National Committee on Prevention, Detection, Evaluation and Treatment of High Blood Pressure: The JNC 7 report. JAMA 2003;289:2560-72. 30. Hahnemann S. Organon of Medicine; §5 and §§83-104; Reprint 5th and 6th ed; New Delhi: B. Jain Publishers (P) Ltd; 1994. 31. Kent JT. Lectures on homoeopathy philosophy; Reprint 4th ed. New Delhi: B. Jain Publishers (P) Ltd; 1997. 32. Boericke W. New Manual of Homoeopathy Materia Medica and Repertory with Relationship of Remedies. First Corrected, Revised and Updated Edition. New Delhi: B. Jain Publishers Pvt. Ltd.; 1998. 33. Allen HC. Keynotes and characteristics with comparisons of some of the leading remedies of the materia medica added with other leading remedies and nosodes. 2nd ed. Kolkata: Medical Book Suppliers (MBS); 2002. 34. Kleijnen J, Knipschild P, Riet G. Clinical trials of homoeopathy. BMJ 1991;302:316-23. 35. Jonas WB, Rachel L Anderson RL, Crawford CC, Lyons JS. A systematic review of the quality of homoeopathy clinical trials. BMC Complement Altern Med 2001;1:12.